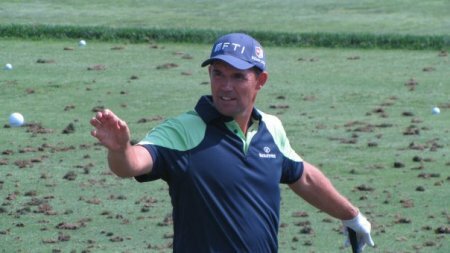 “Great White Shark” Greg Norman believes Padraig Harrington is the biggest predator in major golf after Tiger Woods. The Aussie veteran, 54, does not believe for a minute that the Dubliner can fly under the radar after winning three of the last six majors. And he rates him as the biggest threat to Woods at Augusta thanks to his amazing ability to get the job done in the pressure cooker environment coming down the stretch. Asked to rate Harrington as a major contender, Norman said: “You have to put him way up there. He's probably No. 2 from a major championship standpoint from the last couple of years. “He knows what he's going to do, what's at stake for him to keep that streak of major championships going along. I think his chances are excellent this week. 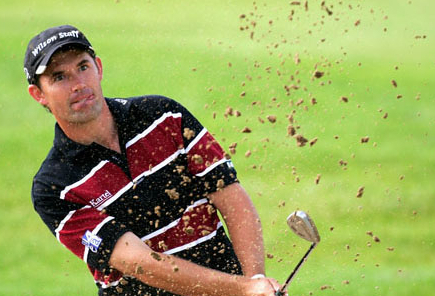 “Padraig has got a great ball flight for this golf course. He hits the ball extremely high, hits it with a lot of spin and he's a great putter. We all know that. Norman got a close up of Harrington the major winner when he partnered him in the final round of the Open at Royal Birkdale last July. The flamboyant Australian had a two stroke lead over Harrington and KJ Choi after three holes but his fairy tale ended when he closed with a 77 to Harrington’s 69 to finish tied third and earn the consolation prize of a Masters return this week after a seven year absence. Far from getting an easy ride this week as golf world focuses on a prospective battle between Woods and Phil Mickelson, Norman knows that Harrington is under enough internal pressure to perform.. He said: “He will know what the next 72 holes means to him, and he was going to be trying to achieve that outcome ultimately. “I don't think he's coming in under the radar screen, because he's knows what he's done, and if the players doesn't know, most players can pick up the newspapers and read what's going on during the week. Norman knows what it is like to suffer major disappointment and like Harrington, he believes he learnt more from his defeats that he did from his victories. When he blew a six-shot lead to lose to the 1996 Masters to Nick Faldo, he took it on the chin and gave a brilliant press conference. Harrington will be going all out for a dream victory but like Norman, he understands how much it hurts to finish second after racking up more than 30 runner up finishes before he took his first major. He said: “Winning is a habit, and some people have that habit and have no understanding of losing. “I think I had a record there, a number of second places, and it was amazing. It was being used as nearly as a stick to beat me with. You work your way through that and it gives you tremendous experience. Majors. They are the ultimate badge of honour in the game of professional golf, yet even if a player manages to win one, it is no guarantee that he will be more respected by his peers than a man with none. Is Colin Montgomerie - a player with five runner up finishes in the four big ones - a lesser player than Todd Hamilton or Ben Curtis, Paul Lawrie, Mark Brooks or even Geoff Ogilvy? Will Darren Clarke or Padraig Harrington be considered inferior to 1947 Open champion Fred Daly if they finish their careers without at least one major on the mantelpiece?